The mission of the Intestinal Health Institute is to improve intestinal and overall health and nutrition through medical research, public service, and education. We are working for your Health, Happiness, and Hope! 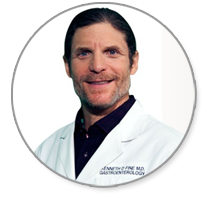 The intestinal Health Institute was conceived because of the public health implications of the scientific discoveries and teaching experience of Kenneth Fine, M.D., a professor, intestinal researcher, and publisher of scientific journal articles for over 20 years. Dr. Fine is determined to bring the benefits of his research and his passion for teaching to those who need it most: the people of the United States and the World. By utilizing the power of the internet and the public's free access to it, the long delay associated with dissemination of new information through the medical ranks to patients (usually 10-15 years) can be bypassed. People can benefit today! America is facing a new health crisis: obesity and dietary malnutrition. The nutrient-poor, calorie-rich "All-American" diet -- fast-food, "junk-food", oversized meal portions -- has swelled the waistline of the average American. Intestinal Health Institute is to further the knowledge base of our areas of study so that other researchers and the population at large may best benefit.